The entrance to the park on the BRazil side. The Iguazu Falls (or Iguaçu Falls) are arguably the most impressive waterfalls I’ve ever seen, even compared to the Niagara Falls and Victoria Falls. 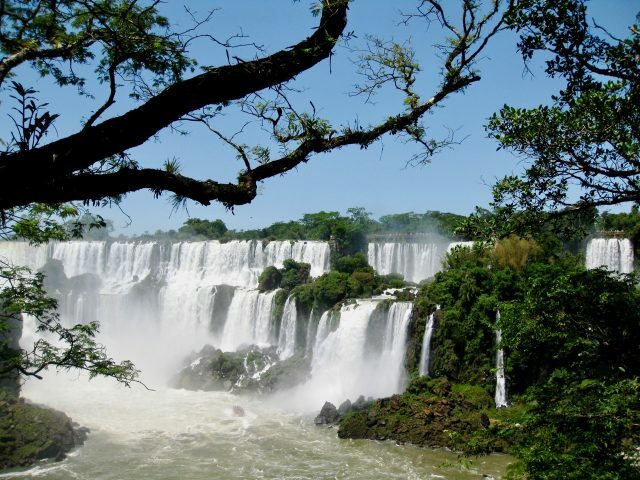 Straddling the border of Brazil and Argentina (map), the falls are one of the prime attractions in both countries. The falls, a UNESCO World Heritage site and voted as one of the Seven Natural Wonders of the World, are composed of a spectacular series of waterfalls (275 to be exact) on both sides of a massive canyon covered by dense, tropical jungle. Together, they make up the largest waterfall system in the world, with varying heights of 60 – 82 meters stretching along 2.7 kilometers! There are many things to do at Iguazu Falls, in both Brazil and Argentina, but the falls themselves are guaranteed to blow everyone off their feet! If you think that they’re just another waterfall and probably not worth the (plane) trip there, you might want to reconsider. The Iguazu Falls are simply mind-blowing! One of the platforms on the Brazil side of the Iguazu Falls. 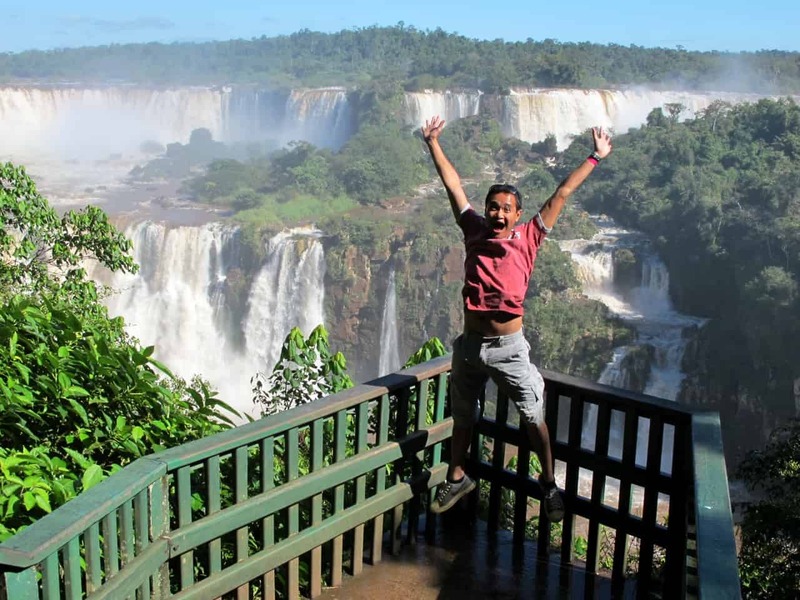 My ‘Jump Shot’ at the Iguazu Falls! 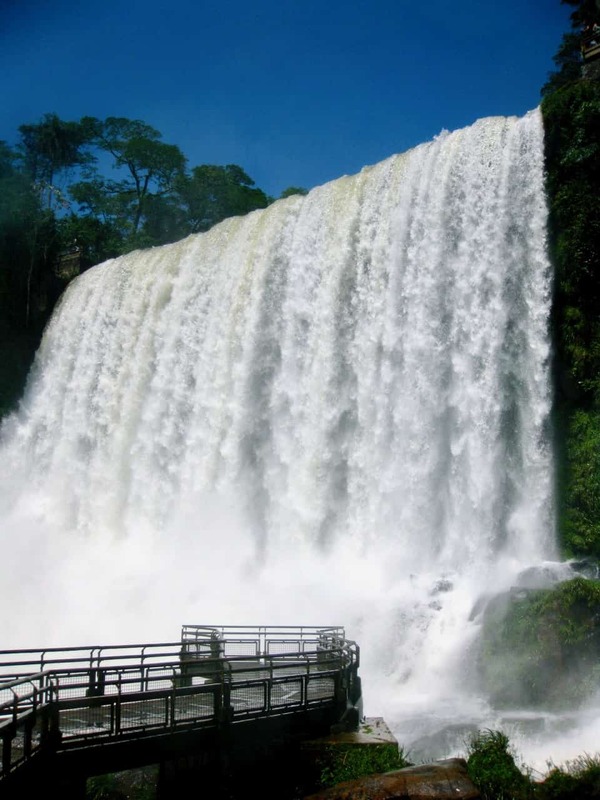 The Brazil side let’s you get very close to the foot of the falls and provides visitors with a panoramic view of the Argentina side, with its multiple cascades. There are many paths that wind along the canyon and the jungle with various viewing platforms along the way. The highlight is the platform and series of walkways at the foot of one of the upper waterfalls. Rainbow at the Iguaçu Falls on the Brazil side. There’s also a walkway that takes visitors to the lower base of the Devil’s Throat falls (see Argentina section below). In addition, there’s a boat-ride from the Brazilian side of the falls which brings visitors close to the foot of the falls (though perhaps not as close as the adrenaline-charged boat-ride from the Argentina side). The view from a platform on the Brazil side of the Falls. Getting soaked at the Brazil side of the falls! The boat tour to the foot of the Iguazu Falls. An expansive network of walkways take visitors above and across the upper and lower levels of the falls. The Argentina side allows visitors to get very close to the falls (above and under the falls). The waves of mist from the falls are absolutely refreshing in the tropical heat! The Argentina side of the Falls features seemingly endless curtains of cascades! A walkway to the foot of one of the falls on the Argentina side. You can stand at the very edge of the Iguazu Falls. View from the edge of the Iguazu Falls on the Argentina side. Chances are, you’ll bump into a coati (member of the racoon family) on one of the trails. There’s also a train within the park, followed by a 1 kilometer trail, which takes visitors to the main attraction on the Argentina side: the awe-inspiring Garganta del Diablo or Devil’s Throat, the highest and most impressive of the falls. Make sure you have a raincoat with you to avoid getting totally drenched (also handy to keep your phone and camera dry)! A rainbow and birds at the Garganta del Diablo (Devil’s Throat), taken in spring (October/November). The Garganto del Diablo in early winter (June/July) after the rains. 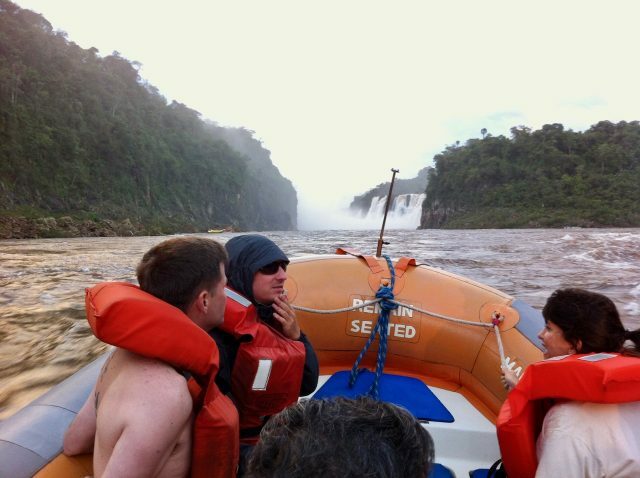 The Argentina side also offers perhaps the most adventurous boat ride to the foot of the falls and San Martin Island. Seeing the falls this close is a humbling (and wet) experience! Just across the road from the main entrance to the Iguassu Falls Visitor Centre (Brazil side), you’ll find the Parque das Aves, or the Bird Park. The Bird Park is home to a multitude of rare birds, colourful parrots, toucans and flamingos, alligators, snakes (including the anaconda) and gorgeous butterflies, in a natural jungle setting. 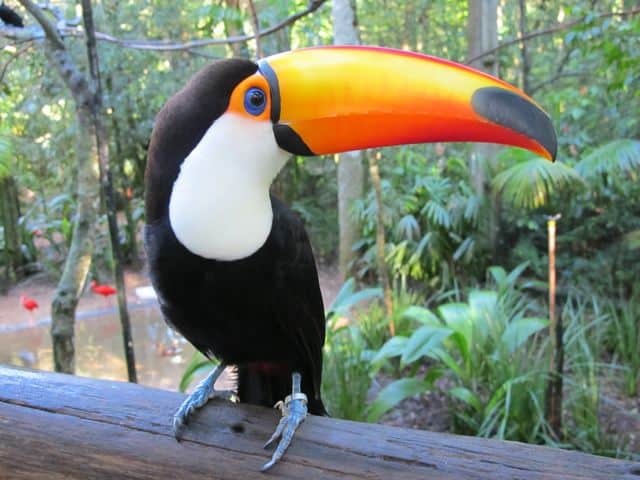 A toucan at Parque das Aves. On both the Brazil and Argentina sides, it’s possible to go for a jungle hike to see more of the dense tropical jungle and its flora and fauna. You’ll see a great variety of trees, plants, birds and insects. There are also jungle adventure tours which feature zip-lines and other adventure activities. 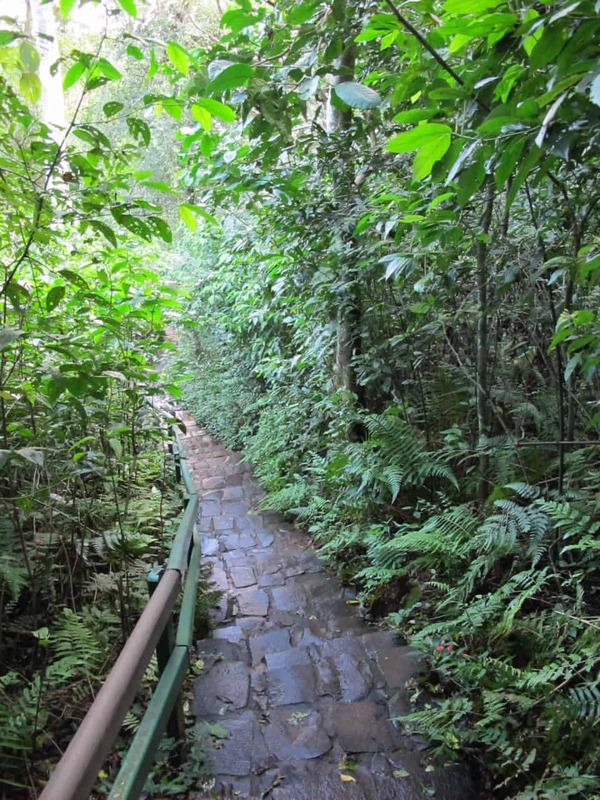 Hike through the jungle at the Iguaçu Falls. Watch out for your belongings when a coati is nearby! 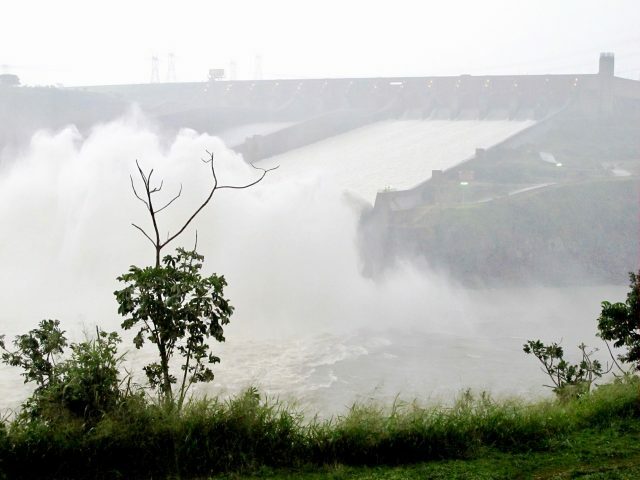 The Itaipu Dam is one of the largest and most powerful dams in the world. It’s possible to go on a guided tour of this humongous dam (on the Brazil side) and learn more about its workings. The dam structure is nothing short of impressive, both inside and outside! 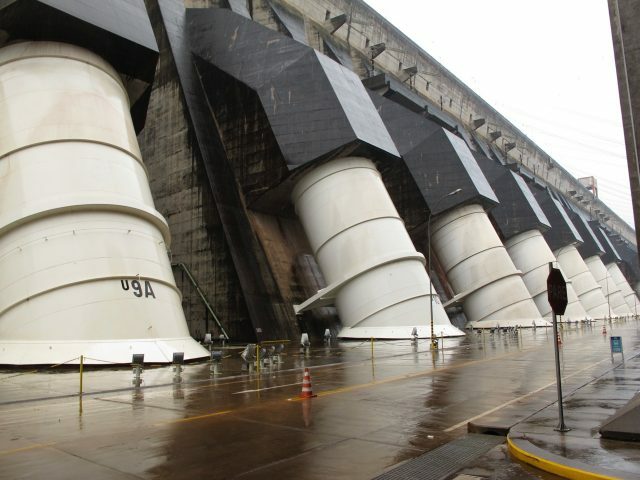 The exterior of the Itaipu Dam. Inside the cavernous Itaipu Dam. When the dam opens its gates! After all those adventures, it’s time for a big meal! Churrascaria are restaurants specialised in grilled meat. While you’re on the Brazil side, a meal at one of the churrascaria is a must (though, avoid at all costs if you’re vegan/vegetarian!). The tender meats are expertly grilled and served as slabs and on skewers. If you’re up for a ‘unique’ experience, you can also ask for the cow’s testicles (grilled of course)! The Bufala Branco Churrascaria is one of the more popular steakhouses in Foz do Iguaçu. Or, you can opt to visit the Rafain Churrascaria which combines a big dinner with a colourful, vibrant cultural show. 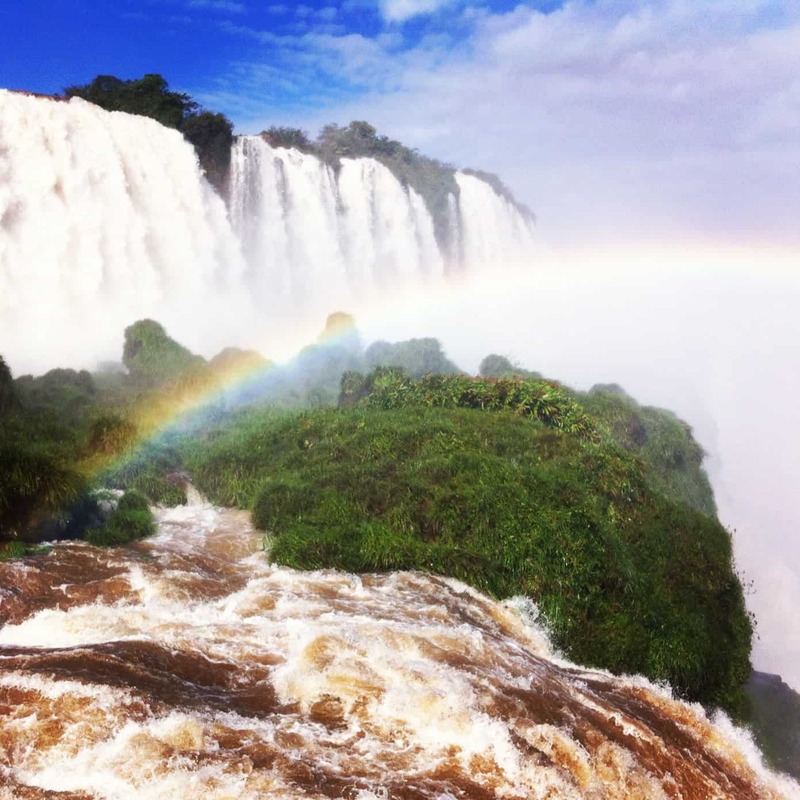 Iguazu Falls – is it better on the Brazil or Argentina side? That’s a question I get pretty often and to be honest, I can’t decide. 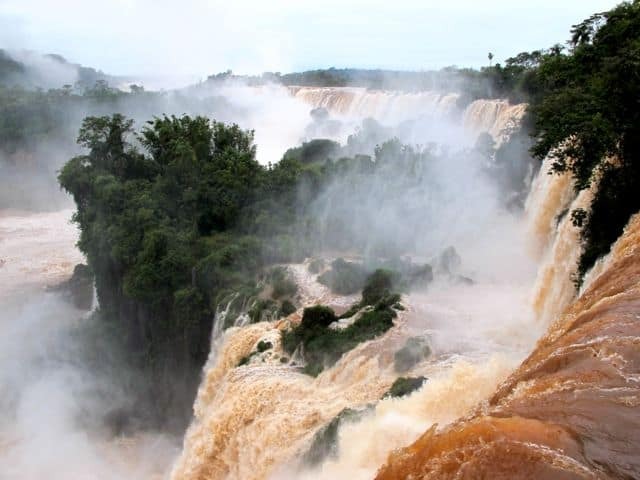 There are lots of things to do at the Iguazu Falls on both the Brazil and Argentina sides. Both have unique perspectives which are hard to compare, so my advice is to see both sides of the falls. The pricey visa cost (for citizens of various countries like USA and Canada) to enter Brazil may be a deterrent but it’s absolutely worth the money in my opinion. I suggest arranging a Brazil visa in advance of your trip. There’s also a Brazilian Consulate at Puerto Iguazú (Argentina) where visas can be obtained but it can be a cumbersome process (link to the TripAdvisor forum on this subject). The Foz do Iguaçu Airport/runway. You can see the clouds of mist from the Garganta del Diablo in the top centre. Getting to the Iguazu Falls is relatively easy. There are airports on both sides of the falls with excellent connections. Foz do Iguaçu in Brazil is the largest city in the region and its airport has frequent connections to major cities in Brazil like Sao Paulo and Rio de Janeiro. Puerto Iguazú in Argentina is a smaller town and its airport has connections with Buenos Aires, amongst others. The Iguazu Falls after rainfall in the winter (July). The Iguazu Falls in spring (October/November). 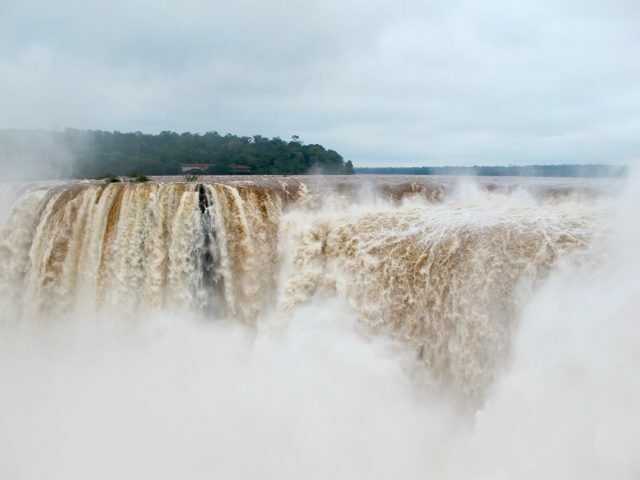 You can easily see both sides of the falls in two days (and include a boat ride on the Argentina side and a visit to the Bird Park on the Brazil side). However, I recommend spending 3-4 days to explore the falls and the surrounding area at a more leisurely pace. With the extra time, you can visit the Itaipu Dam and even cross the border into Paraguay (Ciudad del Este), which is just across the Parana river from Brazil (connected by the Friendship Bridge), for some shopping. There are many accommodation options on both the Brazil and Argentina sides. Foz do Iguaçu is a large city and hence has a bigger variety. I stayed at the Hotel Bella Italia (Booking.com) in the centre of Foz do Iguaçu near a large shopping mall. The rooms are comfortable and the breakfasts are elaborate. Furthermore, the staff are Iguazu experts and can help arrange all sorts of tours and transfers. The hotel also has a very good Italian restaurant. There are a few hotel situated close to the falls and airport such as the Pousada Guata Pora, Hotel Colonial Iguaçu, Wish Foz do Iguaçu and the San Juan Eco Hotel. On the Argentina side in Puerto Iguazú, I can recommend the Iguazu Jungle Lodge, the gorgeous Loi Suites Iguazu Hotel and the Falls Iguazú Hotel and Spa (links to Booking.com). It really is more spectacular than Niagara – in my book, a must-visit in South America! This is one of the few places we still need to visit in South America. Looks even more spectacular than Niagara! If you’re arriving at the airport on the Argentinian side, you can easily take a taxi from the airport to the Argentinian side of the falls. I’m pretty sure the taxi driver will ask you if you want to visit the Brazil side as well. On my first trip to Iguazu, when I arrived at the Argentinian side, I went on a two-day organised tour which included both sides of the falls and an airport pick-up/hotel drop-off. I did chat with some other visitors who did the two sides on their own and it’s apparently pretty easy to do so. Make sure you check if you need a visa for Brazil. I’m not sure how long you’re staying at/near the falls but I doubt amending it would make any difference as it’ll probably be rainy for several days in a row. That said, my experience is that it doesn’t rain for a long time, just short bursts. Make sure you wear shoes with a good grip as the pathways can be very slippery. Cheers & have a great trip! That’s a great post! I am visiting the falls in a couple of days but rain is forecasted for the day of my visit. Would you advise to try and amend my ticket if possible? Also, I cannot find anywhere how you reach the National park from the airport (Argentinian side). Cheers. Glad you enjoyed the post and find it helpful. If you’re talking about a day trip from Puerto Iguazu or Foz do Iguaçu, then yes, a day trip is possible. Wow, your photos are amazing. Thanks for all this information very helpful. 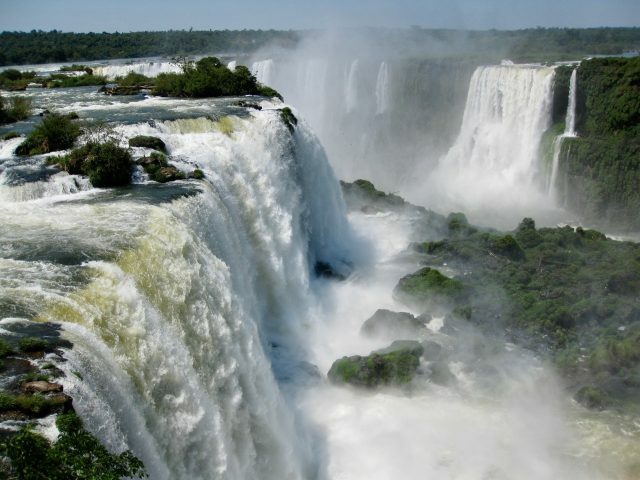 I have always wanted to visit Iguazu Fall and I really hope I’ll get to cross them off my bucket list soon. Is a day trip there enough to explore the place? Simply stunning! loved reading it throughout. Thanks for sharing.